This Renaissance religious wall hanging "Madonna with Child - Rapahel" shows a work by Raphael from 1507. Raphael, the High Renaissance painter from Italy, produced many works showing the Virgin and Child on his tour to Florence from 1504 to 1508. Here we see the Virgin Mary with Jesus in an embrace, in a landscape setting. She is wearing a magenta garment which is feminine, yet with a blue robe to symbolise power. Delicate haloes are seen around their heads to signify their holy auras. 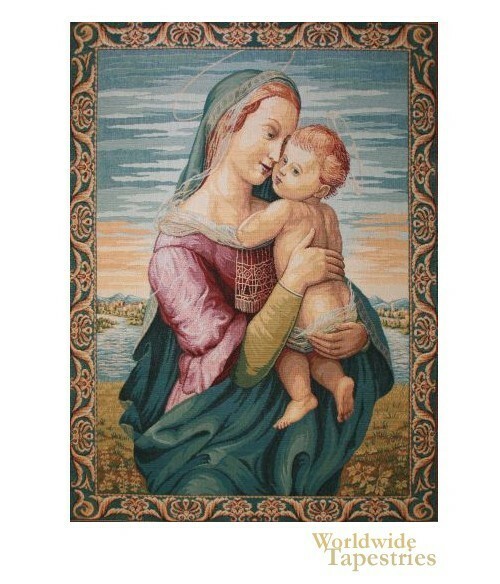 This religious Renaissance art tapestry "Madonna with Child - Rapahel" is lined and has a tunnel for easy hanging.